After meeting up in Constanta, Romania last week, the both UK led NATO maritime task forces SNMG-2 and SNMCMG-2 have arrived in Bulgaria. The mine countermeasure warfare task force made a port call in Burgas while the naval task force arrived in Varna. Standing NATO Mine Counter Measures Group Two (SNMCMG2), under the command of Royal Navy Commander Justin Hains, will depart from Burgas on 11th February. 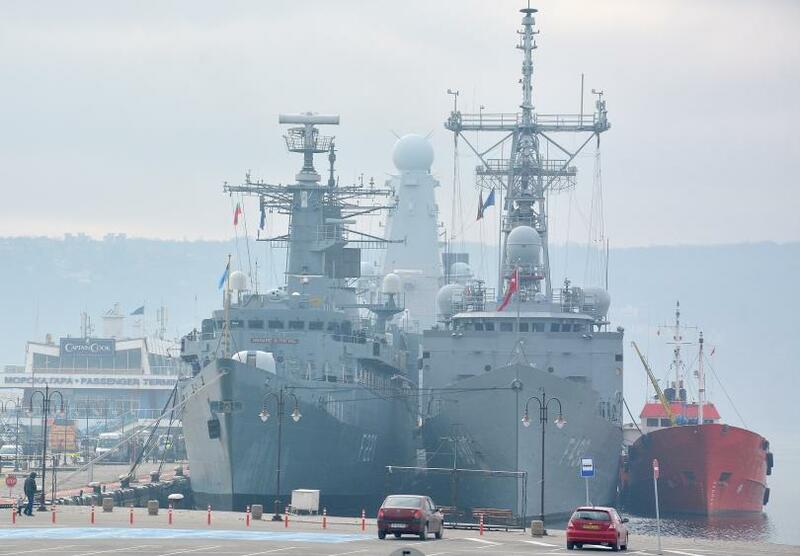 The task group consists of the Romanian minesweeper ROS Lupu Dinescu, Turkish mine hunter M-270 TCG Akçay and H-88 HMS Enterprise the flagship of the task force. Standing NATO Group Two (SNMG2), under the command of Royal Navy Commodore Mike Utley OBE, will depart from Varna on 11th February. The task group consists of the Romanian frigate F-221 ROS Regele Ferdinand, Turkish frigate F-490 TCG Gaziantep and D-37 HMS Duncan the flagship of the task force. NATO has failed on American soil!!! !